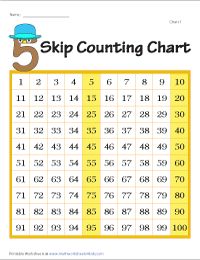 Skip counting is the precursor to all higher order math skill. 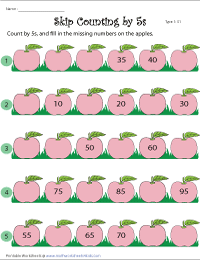 On this page, worksheets on number lines and counting with pictures are available. 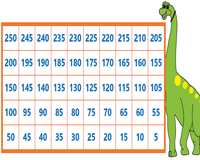 Skip counting charts are also included. Sharpen your math skill by fun activities like mazes and connecting dots. 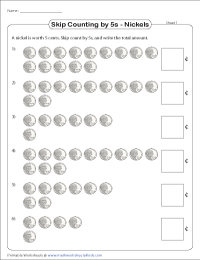 Practice skip count by 5s with these printable worksheets. The display charts consist of spectacular themes to skip count by 5s. Practice forward counting with partial and blank charts. Backward skip count by 5s with the themed display charts. Access the partial and blank charts to review the knowledge acquired. 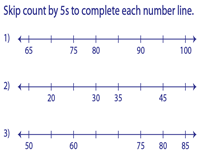 Number line helps the kids to understand the skip count in an easier way. There are two levels in this section. In this section word problems based on counting with real life objects are available. 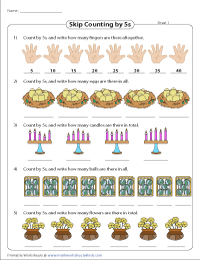 Count the items in each group to find the total. 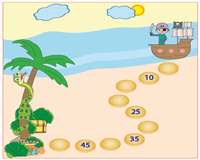 Help the pirate find his way to the treasure chest and guide the frog reach the snail. Skip count by 5s to complete the path. A template is also provided for each level. In this section, apple theme is used. 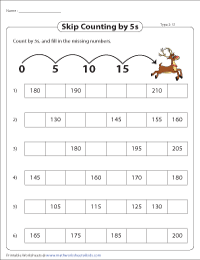 Skip count by 5s to fill in the missing numbers. Each worksheet contains five problems. The reindeer hops by 5s'. Fill in the missing numbers. There are six problems in each worksheet. 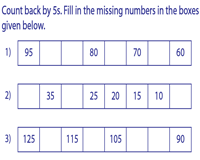 Count back by 5s and fill in the missing numbers. The children master the skip counting when they can count forward and backward. Skip count by 5s to find how many cents are there in all. 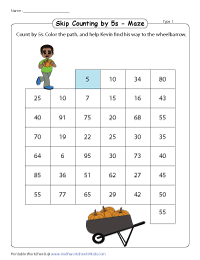 Utilize these colorful maze worksheets to help reinforce skip counting by 5s. Join the dots which are in the intervals of 5s to unlock the picture and color it.